I wanna share another great idea which spawned from eyeballs by day, crafts by night. 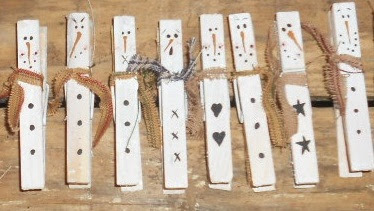 She had used some mini clothespins and painted super cute snowmen on them. Then used them as mini clippies. Well, I've been making a lot of magnets lately so I wondered if I could get a strong enough magnet on these and it be able to hold notes and such on a refrigerator without falling, without looking silly. And here's how I started. 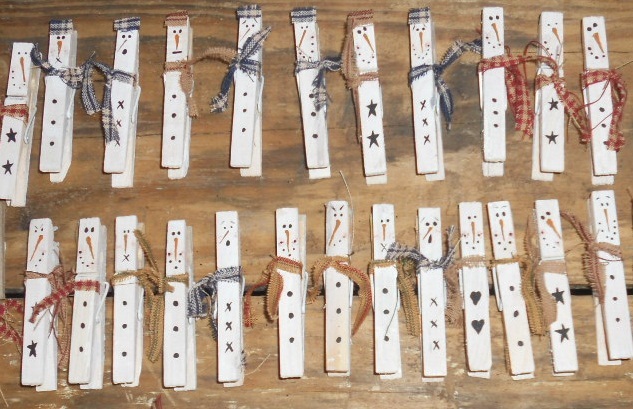 Here's the plain wooden clothespins found at the Dollar Mart for $1.19 for a pack of 50! SUPER DEAL! First, I spray painted them all white in the Rustoleam brand from Walmart. Waited for that to dry, flipped them over, sprayed the backs. And here's another pic of even some more...... But in these notice that I gave them an added hat to match their scarfs! Which I learned that when I stick it on the fridge with a note, it didnt hold so well. So then I tried the round, more sturdy, .75 inch magnet. Found at Michaels which contain 50 magnets for somewhere around $3. I love these. They are super strong, but I had to take scissors and cut in half so it didnt look bad. But that was great, cause in the end, I got 100 strong magnets outta a pack of 50! Whoo hoo to saving money! For some reason I can't find a pic of these on the back, but they did not look bad at all. I just tried to cut super straight because cutting magnets with a small set of scissors is not easy. lol. And here's a few more pics, just because I love how these little guys turned out. lol. Hope you do too! I also went back, after taking these pics and added a piece of homespun to the top left corner of each packet. It just was needing something more cute n' country, I thought. lol. 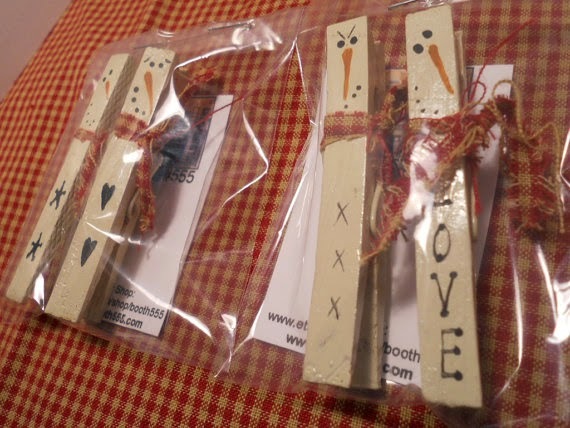 Set of 4 Snowmen Magnets I have packaged up. Don't forget to send me a link to yours if you get time to try these! Thanks for sharing, I am a new follower. stopping by from the harvest hop! Cant wait to try these out with my boys!! Thanks for stopping by Paula! Hope you and your boys have fun with this project! Send me a link to yours when you try it, I'd like to see how they turn out.